Once again trolling Amazon, I’ve discovered a pair of listings for heavy duty hardcover omnibus collections of work from two seminal comic book artists and creators, Jack Kirby and Steve Ditko. Most of the material hasn’t been available since it was originally published 30-50 years ago, but next Summer we’ll have it again. Between the two of them, Kirby and Ditko co-created (in some cases, it’s been argued they solely created) and established the core Marvel Comics universe with Spider-Man, Iron Man, the Hulk, Fantastic Four, Thor, Captain America, Dr. Strange, the Silver Surfer, the original X-Men, and many, many more. Wait, keep your seat. This isn’t that stuff. You see, both Kirby and Ditko worked at one time or another for Marvel’s primary competitor, DC Comics, on lesser known comics. This is that stuff. But despite being lesser known, it’s still worth some excitement. So maybe just attentively lean forward in your seat. In 1957, following the dissolution of his partnership with Joe Simon, Jack Kirby returned to DC Comics. Among his new assignments was the Green Arrow feature that ran simultaneously in ADVENTURE COMICS and WORLD’S FINEST COMICS, pitting the Emerald Archer and his sidekick, Speedy, against a plethora of foes. For Steve Ditko, he left Marvel Comics in the late 1960s after an insurmountable run on The Amazing Spider-Man and trippy Dr. Strange stories, and headed to rival publisher DC Comics where he created characters like the Creeper and the duo Hawk & Dove. The Steve Ditko Omnibus Vol. 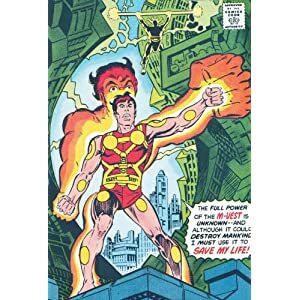 1 listing is scant on details but judging from the cover image above, the book looks to consist of his 8-issue series Shade, the Changing Man from 1977. The character and concepts were significantly revamped for an acclaimed series of the same name by Peter Milligan and Chris Bachalo in 1990, as part of the newly created Vertigo imprint, along side Neil Gaiman’s Sandman and Grant Morrison’s Animal Man. Now you may be wondering to yourself, “What in the world is an omnibus?” And it’s an excellent question. In this instance, it’s not a type of vehicle for transporting a large number of people. Apparently it’s also a publishing term for an anthology or collection of multiple works. The comics world picked it up a few years ago. I think maybe Marvel was the first to use it for an ultra-huge hardcover collection of work that’s usually on the pricy side. It’s like a normal graphic novel on steroids. Now you know!